SOLD TO TATE BRITAIN - Currently on display in Gallery 9. 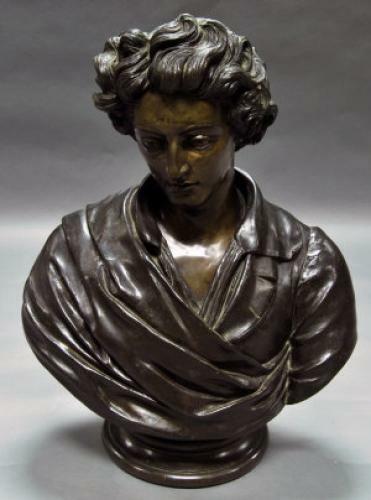 This twice life size bronze bust of the poet Percy Shelley by Amelia Robertson Hill (1820 - 1904) has been acquired by Tate Britain from Horton Art and Antiques. Exhibited at the Royal Scottish Academy in 1882 and highly regarded by critics in its day. The bronze then remained in the artist's home until her death in 1904. Amelia produced only sixty works during her lifetime - mainly portraits, busts and statues - consequently her work is less known to the wider general public. She was one of the first female sculptors to be given a public commission, her most famous work, the statue of David Livingstone in Edinburgh.